Got this discounted online without trying it on, and very happy with it. You can send the pack to Granite Gear to have them swap the belt or straps - I didn't need to do this as it came with a medium hip belt and woman's straps out of the box. I can fit all my gear plus some in this and carry it without feeling dead by the end of the day. I love being able to adjust the frame - narrow shoulders, no problem, move the straps in a notch. My bear can goes in horizontally, which was impossible in an Osprey ultralight pack. I expect to get years of use out of this. Great pack. Extremely comfortable. I just swapped out my old pack (4800ci and 6lb 5oz) to the Ozone (3800ci and 3lb). I couldn't believe how much easier and more comfortable my trip was compared with using the bulky Jack Wolfskin. All my gear fit perfectly for my solo overnighter. With the extension fabric on top I'm sure I could fit enough food/gear to pull off a five-day trip. This pack's suspension made my 22lb pack feel like 15lbs. I have made an effort in the past three years to carry a much lighter load. Previously I had a Gregory Shasta that, trail-ready, went over 50 pounds. I sold that pack and picked up the Nimbus Ozone as the centerpiece of my new lightweight system. It's a very simple design but works wonderfully. The main compartment swallows a ton of stuff and expands at the top when you need a bit more space. The external compression system is excellent, and I use it to carry a fishing rod tube, camera tripod, and other odd-shaped things that don't fit so well in the bag itself. The stretchy pockets on the side are quite large and are good for jackets and other bulky items, but it's hard to access things such as water bottles from them with the pack on your back (especially when the pack is stuffed full). Comfort-wise, the Ozone's harness and hipbelt are top-notch. I've carried 30-pound loads all day long with no sore spots. Probably the most comfortable pack I've ever tried, despite the relatively simple harness/hipbelt design. Lumbar support is perfect, and the myriad of adjustment straps make it easy to shift things around for comfort while walking. It has thus far (on its third season) proved quite durable as well. My biggest nitpick is the internal hydration sleeve. It's nice to have, but to refill it you basically have to empty your gear (or most of it) to get at it. It would also be nice if the interior of the pack was a lighter color to make things easier to see, but not a big deal. The compulsive organizer in me gravitates a bit more to the similar but panel-loading Nimbus Latitude, but in that one you give up the extending collar at the top. 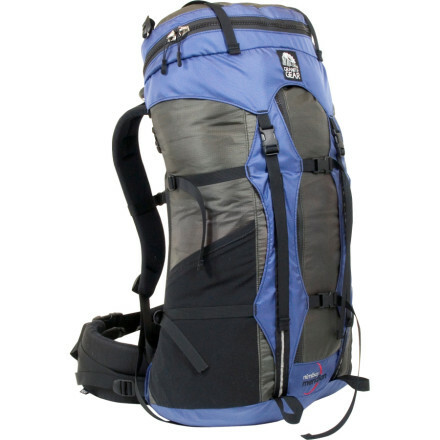 This is an excellent pack and is my weapon of choice for multi-day trips. Well, i just got this pack today and have yet to use it. 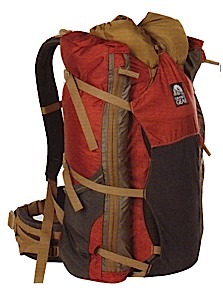 i just wanted to go ahead and share that i am seriously impressed with the fit and features of this pack, and how much pack this is for 3lbs, i've a 2004 model that does have a hydration sleeve and i'm impressed that the reported volume (3800ci) doesn't seem to include the extension collar. i'll get back after i use the darn thing. I concure with everything said by the other reviewer. I concure with everything said by the other reviewer. I too added the largest hip belt/shoulder harness available from Granite Gear. The store where I purchased it ordered the replacement for me and made the exchange. The pack does need a hydration bladder tube exit hole and it is dark inside but even a lighter colored fabric wouldn't help much. The problem is that the pack is a one compartment, top loader and the trade-off is the lighter weight. The top staps should be a few inches longer and I haven't exerienced heavy rain and I am curious how waterproof the rolled-top bag closure is over a long period of rain. I added two Mountain Smith gear pockets to the shoulder straps to increase the effective space which worked well. The trip was for 4 days and the pack performed very well. It rode well and the suspension and comfort were very good. I rate it very good and would recommend it. Weight (claimed): 3 lb. Weight (actual): 3 lb. 1 oz. Max. Load Carried: 42 lbs. Weight (actual): 3 lb. 1 oz. Weight (as tested with replacement hip belt): 3 lb. 8 oz. 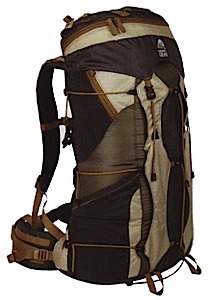 Other lightweight packs owned: Dana Designs Bridger (original design), Gregory Reality, Osprey Aether 60 (2002 version), Russi (Madden) Scrambler. 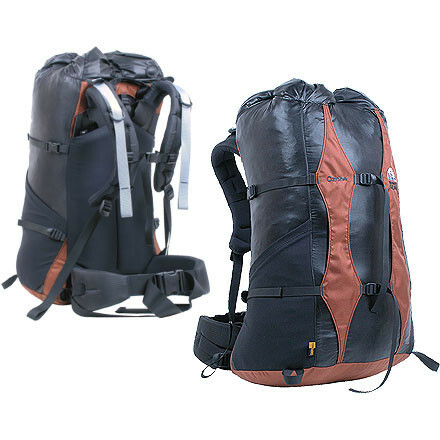 The Nimbus Ozone is a lightweight pack with a minimalist packbag, but a full suspension. The packbag is simply a main compartment with two side pockets and no lid. But the suspension has well-padded shoulder straps and a true padded wraparound hipbelt. The Nimbus Ozone comes with the narrower “Trim” shoulder straps used on the women’s versions of Granite Gear’s heavier packs, but they are sufficient for this lightweight pack. Modification: I replaced the standard “Nimbus Light” hipbelt with the plastic supported “Nimbus” hipbelt from Granite Gear’s heavier packs. I did an exchange directly with Granite Gear. On a shakedown hike with a 37 lb. load, I had found that the “light” hipbelt could not maintain its shape and struggled to keep the load up. Even though the Nimbus hipbelt weighs 7 oz. more than the “light” belt, it is worth it. - With a 42 lb. load, this is the first lightweight pack I’ve tried that is actually comfortable. With a 30 lb. load, the pack doesn’t even feel like it’s there. - The plastic lined Nimbus hipbelt truly supports the pack, just like a belt on a full-sized pack. The load stays on my hips without the belt contorting or sagging. But it is still narrow enough (in height) to provide freedom of movement so I can lift my legs high for cross country travel, scrambling, and climbing. - The 3,800 cu. in. 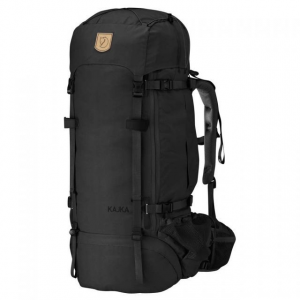 capacity is perfect for weeklong trips (with tent, bear can, fishing gear, novel). The stretch side pockets are tight, but I was able to fit a water filter and small water bottle in one, with tent poles, fishing pole and trowel in the other. I strapped my sleeping pad vertically on the front of the pack. I hung other stuff from the various compression straps. 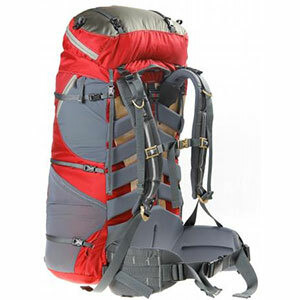 - The suspension is superb, the best I’ve ever tried in a lightweight pack. It is very customizable, though you need a big Phillips screwdriver to adjust it. I’d carry a spare screw (the pack uses three) in my repair kit, just in case. There are 5 sizes of men’s hipbelts and 4 women’s. The standard hipbelt is the “Nimbus Light”, similar to the one used on the lighter Vapor Trail. But the heavier hipbelt, the standard Nimbus version from Granite Gear’s bigger packs, has a plastic exoskeleton and also fits the Nimbus Ozone. All you have to do is call Granite Gear and exchange with them. There are 4 sizes of shoulder harnesses, each available in standard and trim (narrower) versions. And each shoulder harness has 3 attachment points to fine tune the fit even more! There are two pack sizes, each with 5 inches of shoulder strap adjustment, adjustable in 1-inch increments. Pack adjustments can be done without removing any pack parts, and can even be done with the pack fully loaded! Once adjusted, the pack is very, very stable – it feels like a fixed suspension pack. It doesn’t flop around like a lot of packs with adjustable suspensions. All other adjusters work as expected: side stabilizers, compression straps, load lifters, and sternum strap. - The pack has a “3D Tepex” framesheet. There are no stays to give the pack shape. Instead, Granite Gear claims that the framesheet has zones with varying rigidity. I don’t know how it works, but it feels great. I have no complaints at all about the fit. One note: I usually wear a small sized pack, but a regular fit me perfectly (and on a medium setting). - The packbag material is black with colored highlights. It should be the other way around (see the gold colored Osprey Aether 60). I hate black packbags because I can’t see anything inside the bag while loading or unloading it. You cannot even see halfway into the pack in bright sunlight. The only way I could figure out what was in the pack was to feel around or just flip the pack over and empty everything out. - The straps that cross over the top of the packbag to stabilize and compress the pack are way too short. With the pack even moderately extended, the straps barely reach. - There needs to be an exit hole for the drinking tube of a hydration system. The “standard” way to seal the top of the pack (at least in the store and catalog) is to roll up the extension collar, then attach the two compression straps that cross over the top of the pack. But the center of the extension collar is the only exit for my drinking tube. So I just pushed the extension collar down without rolling it, then attached the compression straps. When it rained, I used a rain cover to keep water out of the pack. - The side compression straps and front straps could be a little longer to accommodate larger items. - The shoulder straps, though, had adjusters that were too long, and the side stabilizers on the replacement hipbelt were way too long. SUMMARY: The Granite Gear Nimbus Ozone (with the beefier Nimbus hipbelt) is the first lightweight pack that is comfortable with a 40+ pound load. I was comfortable throughout my entire 8-day trip (other packs are torture for the first few days until the load lightens). It was a joy to wear while doing high class 2 and easy class 3 climbing. This is the first pack since my Dana Designs Bridger that makes me feel like running when I have it on! At the end of my trip, when the pack weighed 30 pounds, I was amazed that it nearly felt like I had no pack on! The Nimbus Ozone really made this year’s trip an enjoyable one. No sore shoulders or aching hips from a sagging pack – I could concentrate on my trip instead. I have no major complaints about the pack. My only improvements would be to lengthen the top compression straps significantly, make the pack material lighter in color, and add an exit hole for a hydration tube. The Nimbus Ozone has been discontinued. The Granite Gear Nimbus Ozone is not available from the stores we monitor. It was last seen March 19, 2014	at CampSaver.com.